Authorized as an optional wear item, this belt buckle may be worn by Officers and enlisted Sailors who have earned the Submarine qualification (this qualification became mandatory for enlisted Sailors in 2009). Per Article 3603.6, the buckle is gold for Officers and CPOs and silver for junior enlisted personnel. 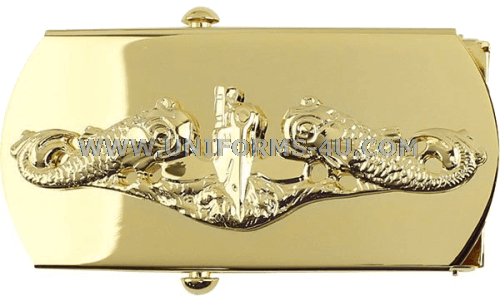 The insignia featured on the buckle is commonly referred to as “Dolphins” or “Fish” and was the brainchild of Ernest J. King, one of the Navy’s most decorated Admirals and one of only five Admirals to be appointed to a five-star rank. King originally came up with the idea for a distinguishing device for qualified submariners in 1912 when he was serving as Commander Submarine Division Three. King submitted his own sketch of an insignia to the Bureau of Navigation, which also requested submissions from other sources. The one thing the designs tended to have in common was the image of a submarine, whether with dolphins or sharks or with a traditional Navy shield. The insignia finally chosen was actually a combination of two different designs submitted by the same civilian firm; it was approved in 1924.